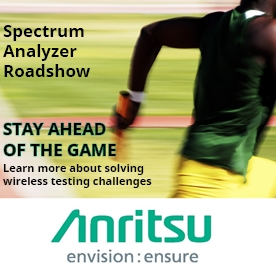 Anritsu Corporation will be hitting the road again this October to talk to engineers about how they can address the ever-increasing complexity and performance requirements of Spectrum Analyzers. They will hold 36 events in 15 countries across Europe, each taking the form of a one-day seminar which will be divided into several parts designed to cover the key aspects of Spectrum Analyzers and the testing challenges they need to know in order to stay ahead of the game. With the increasing number of new applications in wireless technologies, the Spectrum Analyzer has evolved to address the new testing challenges. The key topics of discussion at these events will address some of these challenges and include: implementing a simple channel sounding/measurement system using a standard Vector Signal Analyzer; OTA (Over-The-Air) and Field Test measurements in mmW bands including a look at an innovative drone-based measurement solution; techniques for high-performance mmW measurements using external mixers; the importance of amplitude level flatness in wideband Signal Analyzer measurements; a review of the requirements of 3GPP 5GNR RF measurements; the differences in Spectrum Analyzer architectures; and much more. The Anritsu “Spectrum Analyzer” European Roadshow will be held at multiple locations across the UK and Ireland from the 9th to the 20th of October, before moving on to Germany, Netherlands, France, Italy, Spain, the Nordics, and more. Visit the Spectrum Analyzer Roadshow website for dates, locations, and registration information.